Opt for rugged sophistication with this stylish brown leather strap watch with highlighted stitching, from the Boss Orange collection. Featuring a smart black dial with cream and orange accents, and boasting 50 metres water resistance. 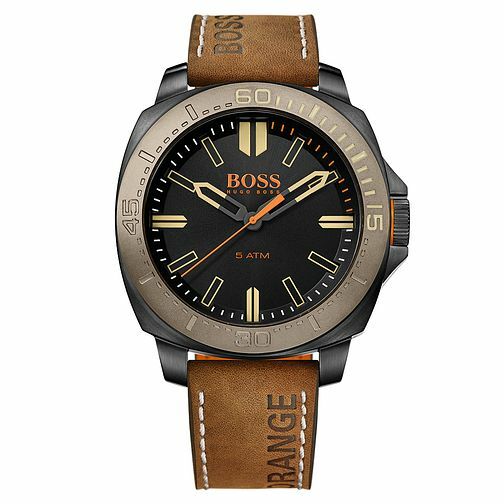 Boss Orange Men's Black Dial Brown Leather Strap Watch is rated 3.0 out of 5 by 2. Rated 5 out of 5 by Anonymous from Great watch This watch looks good and is go high quality. Very fashionable and easy to clean. Rated 1 out of 5 by Anonymous from Faulty The watch stopped working the day after I bought it, and i returned it for a refund.